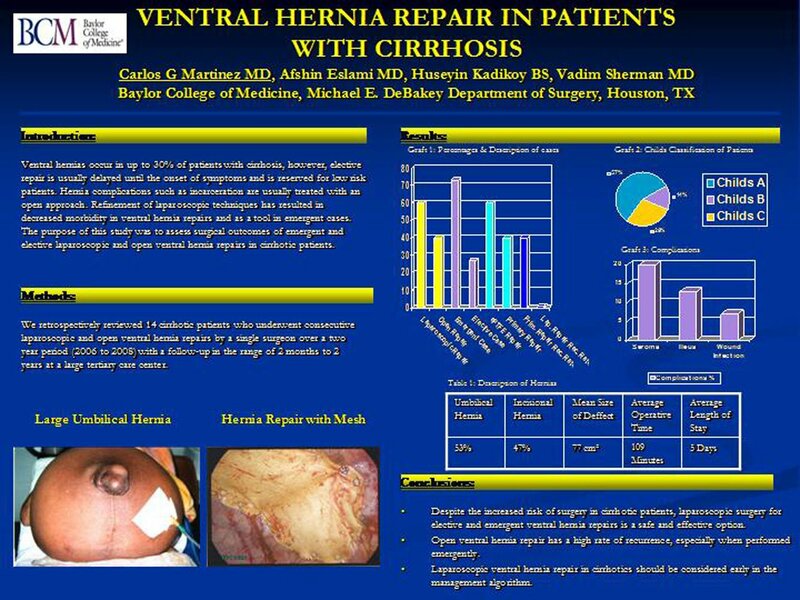 Ventral Hernia Repair in Patients with Cirrhosis. Ventral hernias occur in up to 30% of patients with cirrhosis, however, elective repair is usually delayed until the onset of symptoms and is reserved for low risk patients. Hernia complications such as incarceration are usually treated with an open approach. Refinement of laparoscopic techniques has resulted in decreased morbidity in ventral hernia repairs and as a tool in emergent cases. The purpose of this study was to assess surgical outcomes of emergent and elective laparoscopic and open ventral hernia repairs in cirrhotic patients. We retrospectively reviewed 14 cirrhotic patients who underwent 15 consecutive laparoscopic and open ventral hernia repairs by a single surgeon over a two year period (2006 to 2008) with a follow-up in the range of 2 months to 2 years at a large tertiary care center. 8/14 (57%) of patients were in class A, 2/14 (14%) were in class B, and 4/14 (29%) were in class C of the Child-Pugh classification. 9/15 (60%) of all the hernia procedures were attempted or completed laparoscopically and 6/15 (40%) were primary open repairs. 11/15 (73%) of cases were emergent (bowel incarceration, strangulation, or leaking ascites) and 4/15 (27%) were elective. 8/15 (53%) patients had incarcerated hernias. Of those, 1/8 (13%) had strangulated bowel which required a small bowel resection. Of the emergent cases, 8/11 (73%) were attempted laparoscopically, 6/11 (55%) were completed laparoscopically, and 2/11 (18%) were converted to an open procedure. 3/11 (27%) of the emergent cases were primary open cases. Of elective cases, 1/4 (25%) were completed laparoscopically and 3/4 (75%) were completed as open cases. 8/15 (53%) of the cases were umbilical hernias and 7/15 (47%) incisional hernias. 9/15 (60%) of the hernias were repaired with ePTFE mesh and 6/15 (40%) were repaired primarily. Of those repaired primarily, 2/5 (40%) of the hernias recurred and required a second repair with mesh. The mean size of the defects were 77 cm² (range 4 to 150). Operative time averaged 109 min (range 75 to 195) and estimated blood loss averaged 125cc (range 50 to 200). Length of hospital stay (LOS) averaged 5 days (range 1 to 16). 6/14 (42%) patients were inpatients and 8/14 (58%) were outpatients at the time of hernia repair. The LOS averaged 7 days for the inpatient hernia repairs and 4 days for the outpatient hernia repairs (range 1 to 16 days). The complications of surgery included seroma 3/15 (20%), postoperative ileus 2/14 (13%), and wound infection 1/15 (7%). Despite the increased risk of surgery in cirrhotic patients, laparoscopic surgery for elective and emergent ventral hernia repairs is a safe and effective option. Open ventral hernia repair has a high rate of recurrence, especially when performed emergently. Laparoscopic ventral hernia repair in cirrhotics should be considered early in the management algorithm.